So … how did you sell out all 400+ tickets three months before the event even started? What was your content marketing strategy? This is the question a friendly reporter asked me during the opening night party for Authority Intensive 2014. “That’s a great question,” I said, stalling. Truth was, I didn’t know exactly how to respond. What, exactly, had we done to sell so many tickets so quickly? “We invited our audience to attend, largely by sending out a few emails,” he said. Wow. That was a lightbulb moment for me. I’d heard Sonia when she said that your audience is your most valuable asset. But now I got it. And if it’s email subscribers that you’re after — the kind of engaged subscribers who will help you sell out your first ever live event months before it begins — then Generate Pro is your way to go. 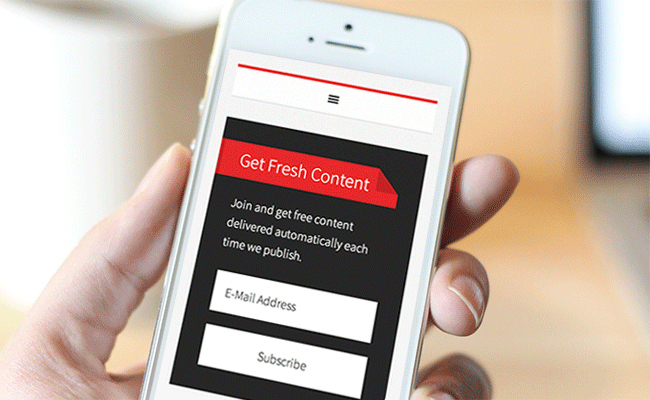 Because Generate Pro was literally designed with one objective in mind: to drive subscribers to your email list. But Generate Pro employs a minimalist structure and a simple-to-set-up subscription header widget that makes it the most fine-tuned StudioPress theme ever for driving subscriptions. And as the story above illustrates, driving email subscriptions is what drives real (some might even say … unfair) business results online. Remember: mobile responsiveness is no longer a nice-to-have feature. It’s a necessity. With Generate Pro, your site is mobile responsive right out of the box — so no matter what device you or your audience is using to browse your site, the view and experience will be optimized. The Internet isn’t always a friendly and predictable place. Hackers will find long-overlooked security holes. WordPress will regularly release important core updates. And sometimes even your own tinkering will cause the dreaded and feared white screen of death. Which is why it’s nice to know that one of the most robust WordPress communities and one of the most experienced and successful WordPress development teams in the world has your back. You can rest easy at night because Generate Pro is built on the Genesis Framework, which passes regular security checks by core WordPress developers. You need not fret when WordPress updates come out, because Genesis will be updated as well to correspond without issue. You don’t have to cry when something you do boinks your site, because you have the StudioPress support team and community to help you. Create content and build value for your audience. We’ll take care of the rest. The question you need to answer is are you building a website … or are you building a business? If it’s the latter, then building an audience must be your number one priority. And that means reaching people at their most intimate online touchpoint: their inboxes.